I wrote this tutorial and have it posted on a page on my blog at www.quiltedfabricart.com but thought I would share it here in case any 52 quilters blog followers might like to try this. 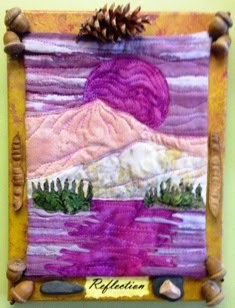 This method will enhance any type of small or minature wall hanging - enjoy! Mounting your art quilt on stretched canvas can take your work from a potholder hanging on the wall to a cool piece of artwork. You can purchase stretched canvas very inexpensively. Look at places like Micheal’s or Hobby Lobby. They come in various sizes and that will depend on the size of your quilt and how much of the canvas you want to show. As you can see in these examples below – I like to leave some room for embellishments and words of wisdom but some people like to have just a tiny bit showing to give just a little bit of a frame. Basically you want to cover your canvas with anything that you feel will enhance the beauty of your art quilt. 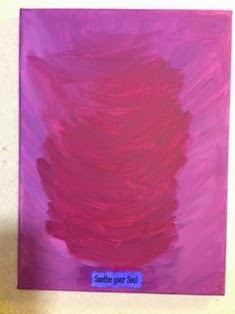 The simplest way is to paint with plain old acrylic paints any way you like – brush, sponge, rag – any method that works for you. 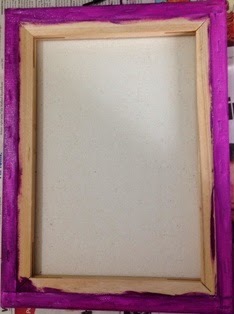 Once the front is dry, turn it over and paint the sides and the canvas on the back. 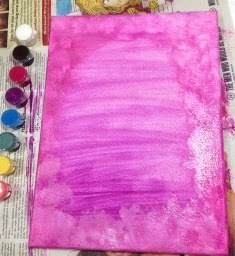 If you don’t want to paint, you could cover with fabric and staple it to the back. Or you could decoupage with paper and white glue using your favorite method. If you will be adding words or embellishments that need to be glued do it now before you glue down your quilt. 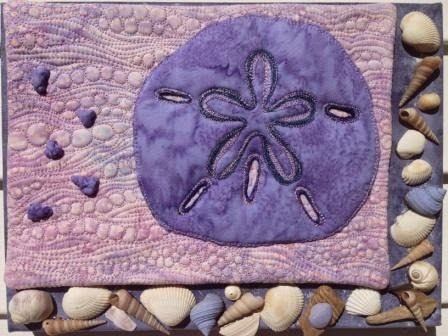 Place your art quilt down first to decide where you want the embellishments. You could mark with a pencil dot to remember. I like to print out my words and then decopage them down using a matte white glue such as mod podge. Below I took the same paint that I used to paint the canvas, watered it down and lightly painted the quote so it would blend in. 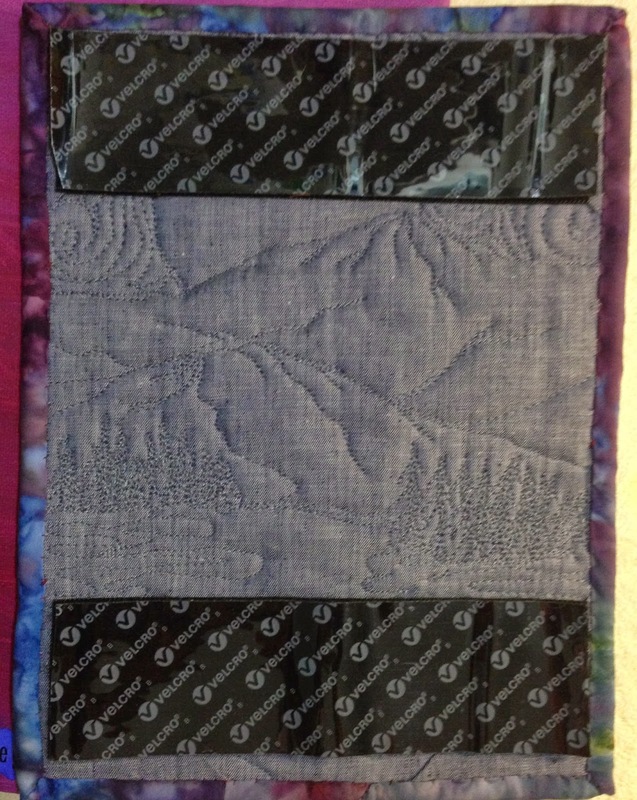 The easiest way to attach your art quilt is to use wide heavy duty velcro – the stick on kind. You can buy it at any hardware store. It holds really well and if you want to change out your canvas all you have to do is rip it off. 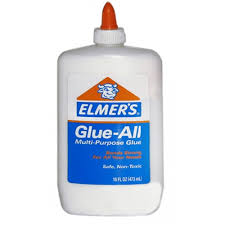 Another method is to use good old Elmer’s Glue but make sure you use the Glue All kind that is good on fabrics and apply plenty of it. I have also used my trusty glue gun and that worked fine as well. Any strong glue that works on fabric to fabric will do. 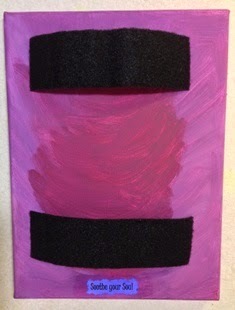 If you do use glue it is a good idea to put felt on the back for a better stick. 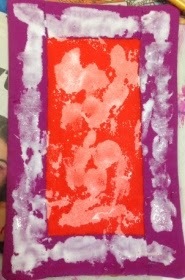 On the piece above I used felt for the back (the orange) but as you can see the facing is not felt. A better solution would be to hand stitch the felt to the back. That way if you wanted to remove the art quilt from the canvas you could remove the felt and leave the quilt unharmed. 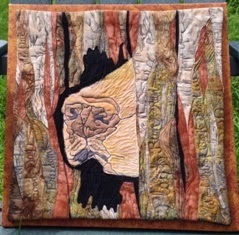 The felt is optional - I have done it with or without and the quilt seemed to stay just fine but I have read alot of other art quilters suggest the felt so I wanted to include the suggestion. For a larger piece (anything over 14") I would probablly take the extra step with the felt. No matter which method you use, after you put the quilt on the canvas with the glue – weigh it down with a heavy book or box and let it sit for at least a half hour for a good hold. To finish it off, for a more professional look you may want to glue paper to the back to cover up the wood. Screw or staple a hanging wire to the back and your done! 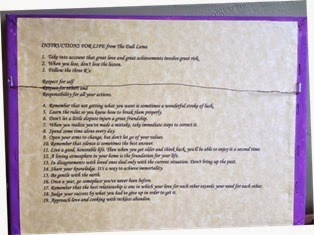 On the piece below I printed out words of wisdom for the paper on the back. 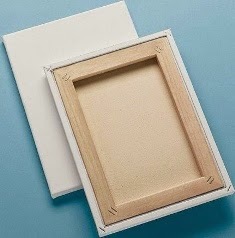 If you use a 9”x12” canvas a standard 8.5”x11” print paper will fit nicely on the back. Think of the possibilities! Or you could just leave the back as is and it will easily hang on a nail or hook – no wire needed. I hope you try this the next time you make a mini art quilt - it really does make a big difference in the presentaion of your creative self.